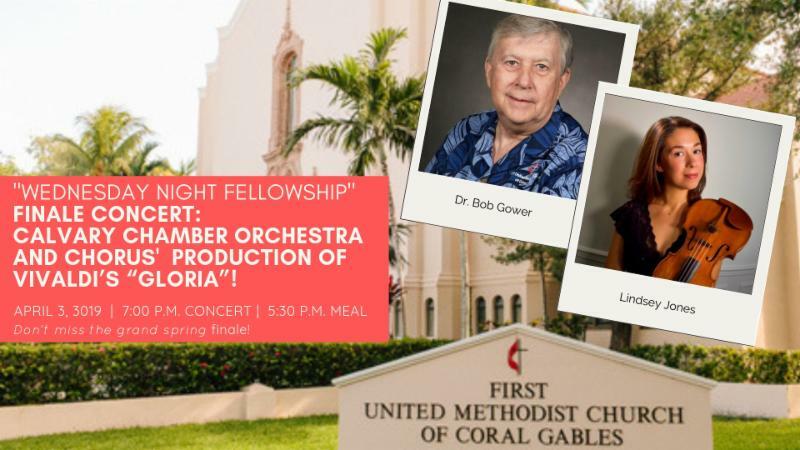 First United Methodist Church of Coral Gables: Coral Gables, FL > "Wednesday Night Fellowship" Grand Finale Concert is April 3! This Wednesday evening, April 3rd, our Wednesday Evening Fellowship will have its Spring 2019 Grand Finale. 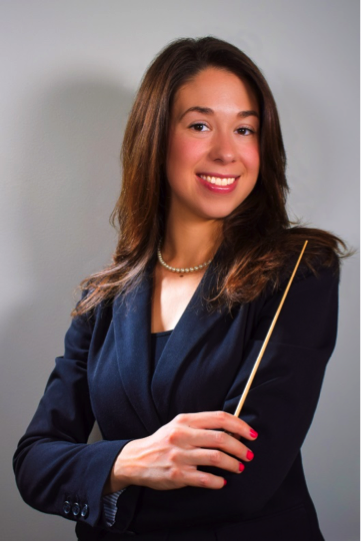 Ms. Lindsey Jones (pictured) will conduct the Calvary Chamber Orchestra and Chorus in a performance of Vivaldi's "Gloria." The concert will begin at 7:00 p.m. after the Fellowship meal which begins at 5:30 p.m.; service will finish at 6:45. The meal, catered by our friends at Pollo Tropical, will be held in Founders Hall. And, as usual, the evening will be full of surprises. Lindsey has assembled this fine orchestra from among the best musicians in Miami. No less a master than our own Dr. Bob Gower will be at the keyboard of the electronic harpsichord/organ. The chorus is comprised of many of your favorite FUMCCG chancel choir members, judiciously augmented with congregation favorites like Paul and Jackie Whiting. The Vivaldi Gloria calls for a contralto soloist, and we are honored to have Sr. Edgar Botta, featured contralto soloist of the Miami Collegium Musicum, as our a soloist for this performance. And if that wasn't enough, our masters of "Flan-tastic" flans, Giova Short and Fabie Moody, have agreed to make flans for our dessert. So it will not only be Pollo Tropical chicken, black beans, white rice, rolls and salad, but also delicious homemade flan for dessert. Be sure to come early and stay late to enjoy all the fun. Have a great meal, hear a marvelous concert, and meet the wonderful musicians afterwards. It will be an evening to remember. Please make plans join us next Wednesday, April 3rd. Child care services are available for each gathering but must be requested in advance. Please call the Church Office at (305) 445-2578 to make your request and to let us know if you have any special needs.